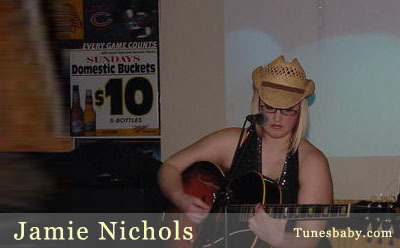 Jamie Nichols: www.myspace.com/jamienichols (vocals) was born and raised in Chicago on blues, country and rock. Her father's Chicago and Nashville music legendry instilled in her an eclectic style that complements her edgy lyrics and harmonic vocals. After touring throughout the West Coast, she has found herself back in Chicago with an amazing band. She is currently backed by some of the most prolific and exciting musicians in Chicago. Bassist Matthew Golombisky is a versatile, incredibly solid, and thoroughly badass performer. Vibraphonist Matthew McClimon lends a superbly melodic and subtly ethereal mood to this acoustic collective. And Quin Kirchner adds a ferocious beat and a high-energy drumming style.